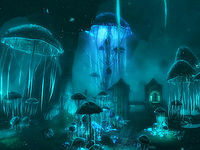 Blackreach is an immense, naturally lit cavern inhabited by hordes of Falmer and containing the ruins of a Dwemer city. The cavern itself is reached by traversing any of three Dwemer ruins: Alftand (southwest of Winterhold), Mzinchaleft (southwest of Dawnstar), or Raldbthar (west-southwest of Windhelm). 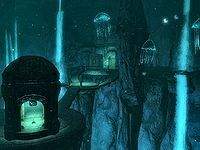 In order to access the entrances to Blackreach from these ruins, the attunement sphere is needed to reveal the stairs leading to each entrance. The Dwemer theme of the ruins continues within the cavern proper, featuring what appears to be a small city, which has long since been claimed by Falmer. The most northern point of the cavern features a Dwemer observatory and a lift to the surface for easy access. Blackreach is the only place where crimson nirnroot can be found, which was of great interest to the great botanical alchemist, Sinderion. The cavern also houses many geode veins, which can be mined for soul gems using a pickaxe, as well as an assortment of other ore veins scattered around. Blackreach is a huge cavern that can be difficult to navigate, especially since your in-game map will only ever allow you to see part of the cavern. Sinderion's Field Laboratory — Sinderion's alchemical foothold in Blackreach. This is the only building in Blackreach that contains an alchemy lab, an arcane enchanter, a cooking pot, or a workbench. Once you enter Blackreach, there are several different exits from Blackreach to Skyrim. The quickest way to the surface is by using any of the "Great Lifts", which are effectively elevator shafts leading to gatehouses on the surface. These lifts can only be accessed from Blackreach, however once you open the gate at the top of the lift it becomes a new access point for Blackreach, with a quick-travel marker on your map. One other exit, the Tower of Mzark, must also be initially accessed from Blackreach. Scroll ScoutingDG: Obtain all three Elder Scrolls for Dexion Evicus. 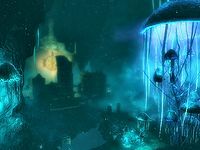 For historical information on Blackreach, see the lore article. Using the Unrelenting Force shout on the large orange globe hanging above the Silent City will summon Vulthuryol, a dragon, to attack you. There are 36 geode veins scattered throughout Blackreach: 34 in the cavern itself, and 2 in Silent City Catacombs. 23 of these geode veins can be mined to yield level-dependent empty soul gems (grand soul gems and black soul gems start to appear at level 16 with a very low probability, that increases till level 30 (grand)/31 (black)). However, the other 13 geode veins are no different from standard corundum ore veins; these veins will always yield three corundum ores, with a chance of also yielding one or more regular gems. Aside from these geode veins, Blackreach also has several ebony, gold and corundum ore veins. Even though it's a dungeon, in-game it's considered to be outdoors. This makes the Summon ArvakDG spell and the Storm Call shout usable, but not the Call Dragon shout. In previous versions, vampires would suffer from the sun in Blackreach, but this was changed in a patch. One copy of the Heavy Armor skill book 2920, MidYear, v6 can be found on a table at the top of the stands overlooking the ring (with the lever activating a rotating blade trap) just south of the War Quarters. The doors to the three Great Lift locations will reset if you are away from them long enough, and need to be reopened from the Blackreach side. The door to the Tower of Mzark stays open always, once you have unlocked it. Lifts to the surface can occasionally cause the game to effectively freeze on the loading screen, barring all actions apart from quick-loading. This can be fixed by pressing tilde and waiting 5-10 seconds, then pressing tilde again to close the console, or by repeatedly pressing Q to open the favorites menu. This can also be prevented entirely by temporarily disabling autosaves on traveling, and then enabling them after using the lifts. Another way of fixing this is typing in the console "disableplayercontrols" then closing the console then immediately typing in the console "enableplayercontrols". Hitting the guide button at the moment the loading screen goes away, but before it comes back can also break the glitch. Note: This glitch tends to occur when attempting to use the lift with more than one follower. When the glitch occurs and the screen will effectively go dark in an attempt to load, if auto-save is used when entering new locations, all your previous auto-save blocks will be overwritten with the auto-save from using the lift. You will have to restart the Xbox or use the Xbox button to return to the dashboard and load Skyrim again. You will then have to choose a previous save before entering the lift that created the glitch. Disable auto-save upon travel will prevent this bug from happening. This appears to have been fixed by version 1.6 of the Official Skyrim patch, although some may still experience this glitch. Attempting to exit at Mzinchaleft and immediately returning can cause Blackreach to have normal daylight or even snowy weather, just like any area above ground. Entering a Falmer hut at the southwest end of Blackreach, near the Tower of Mzark, can cause you to become stuck permanently inside. For some reason, the collision around the hut's doorway allows the player to enter but never to exit. This can also be observed with a Falmer should one spawn within the hut. If you're a Werewolf, you can enter Beast Form to get unstuck. If a Falmer approaches you can unstick yourself by performing a cinematic kill. Using the Fireball spell on a Falmer may cause the game to crash. Sometimes followers can get stuck on the stairs of Sinderion's Lab. Using Unrelenting Force to push them off, or simply using the "wait" feature can resolve this. Casting a Summon Spell (i.e. Conjure Dremora Lord) will often bring the summoned creature into play in a different location than the caster was aiming, either to one side, behind the caster or, in areas with different levels, vertically. Two Chaurus Reapers may spawn near the Catacombs entrance, completely unresponsive. Even when hit, they do not move or react. ? The Corundum ore vein just south of the Farm Overseer's House cannot be interacted with. A Falmer tent at the southeastern end, near the entrance to Raldbthar, cannot be entered. A Falmer enemy may spawn inside the tent, unable to leave. ? This page was last modified on 19 February 2019, at 13:42.